I know it's a little late for this idea, but I thought it funny nonetheless. The best thing that the Trump campaign could have done is to have given this woman exactly what she wanted. A seat right next to Mark Cuban at the debates. When she lost it and went over the fence crazy it would have highlighted just exactly what a Hillary supporter is really like. You already see the roving hate gang of thugs she has enlisted on her Twitter page already that are swarming on men and trump supporters. Interestingly, all negative comments to her Twitter are labeled Anti-Hillary supporters. Wonder how she miraculously knows that!?? They only admonish HER, not Hillary. 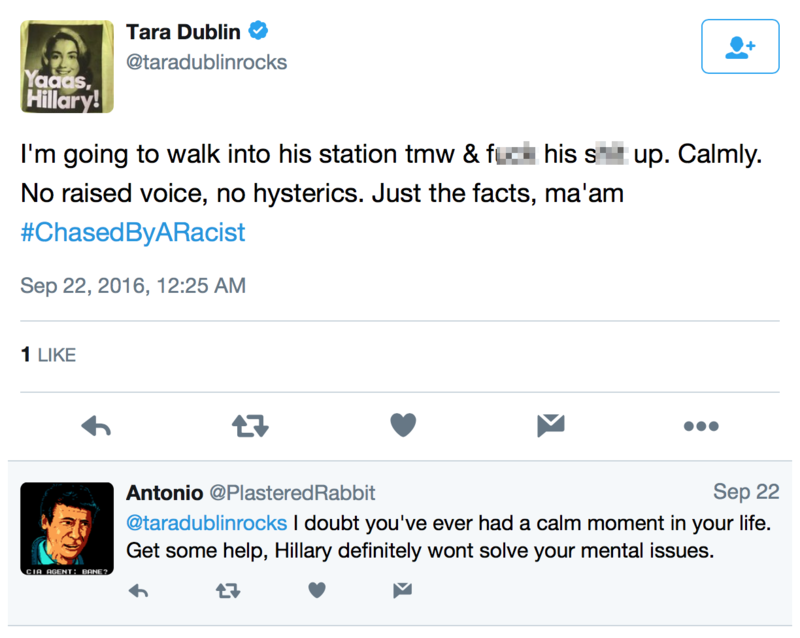 She boasts of her roving gang through hashtags like #avengetara, etc. Calls the guy #ChaseyMcRoidRage, #ChasedByARacist and links to some slanderous website doxxing him. She boasts of calling the ACLU on the cop after she files a complaint at the local police station on the cop for not being sensitive enough to her feelings and the situation and asking he get sensitivity training. Claims cop said in their conversation, "she deserved it", though nowhere in the conversation with her did I ever hear that on the video. Who knows, she selectively edited out sound in certain sections of her video, to cover up what? Recent post of hers saying the cop said, "she deserved it". Did anyone hear that in the video? I didn't. Can anyone Fact Check that? So now she' going full force at the guy and the cop. Contacting federal agencies, legal causes, celebrities, Hillary's campaign, etc. Speaking of Hillarys campaign. She's offering herself to Hillary as a shining example of being preyed upon and wants Hillary to use her as an example. See this tweet. Funny, if she gets her wish this story will blowback on her spotlighting her harassment and bullying on the guy too. I merely retweeted something that was tweeted by a deplorable and I was blocked...But I have two accounts so I still can LOL with the other one. The woman is certifiable. I honestly believe she is/was having a manic episode of some sort. That or she is just not at all in touch with reality. Her incessant tweeting celebrities and journalists, even George Takei, is sad. And awkward. That was something that I thought about as well, the ex husband is watching all of this with a huge smile on his face, knowing that he is getting his kids away from this nutcase and he won't have to pay alimony anymore. Any man that has ever been involved with a crazy woman like this will tell you, she didn't act like that when I first met her. At first she acted normal and sweet until that first episode where she snapped. Some guys get the luck of saying I'm glad i got out of there before I got her pregnant, and other guys are like this ex husband, just watching her implode enough to get his kids away from her. Precisely what happened to me...I just waited and it finally came to a head. I had kept everything I had on her for years and presented it all. She ended up settling with what I wanted and I now have primary with all decision rights and am getting child support. She, meanwhile, continues to implode to the point that my getting full custody will happen soon....had it written in to the settlement that if certain things occur we go directly back before a judge to take away any custody she has. She has to have bandages on her fingers from Tweeting so much! She's like a Steven King novel horror movie. What else is there to do when you don't have a job? Oh wait...you could focus on GETTING a job and your kids....but don't let those things get in the way of your tirade right? How did you find this? I love reading stuff like that and I am glad he took action. She posted his public info on Twitter the other day...Guess that was the final straw. That proves to me the guy isn't a total a-hole and sounds like he is level headed. After all that, he did not file anything until this week. BTW, someone asked if the cop said she "deserved it." I just re-cringed through that part of the video and he NEVER said anything like that. I give props to the cop for keeping his cool...I would have lost my sh!t with her, no doubt about it. Anyone know what department and what his name is? I'd like to send him a card or something for being awesome. If I can figure out how to add the screen shots I will do that too, should she respond. Maybe I'll be "nice" to her about it and act like a fan girl. I wish she'd see this thread...I mean she has had to, right? You just know this nut job googles her name multiple times a day and I am sure it's on the first page of results given how long this thread has gotten. Here's her first classic tweet about what she was going to do to the cop. I had to censor it for ATS PG-Rating. How would she do if her ex-husband called the cop and the dude to court to demonstrate to the judge she is unfit for his kids? She's definitely going back to living with her parents I'm guessing. Do it as a fan girl and hashtag the Team Tara crap...she will eat it up. Oh...and he filed it against her...so she is the defendant in the case...he probably has a LOAD of evidence against her.